James, 45, was living on the floor of his payee’s home when he became connected with Disability Network staff. James’ payee was not allowing him access to his money; they were using his Social Security Disability Income to pay their own bills. Disability Network staff immediately began supporting James by assisting him in getting connected with payee services through a local agency. When James’ payee learned of this, they kicked him out of their house. James was then homeless and living at the local shelter. Disability Network staff worked with James to identify housing options in the community that he could afford. Within a month, he secured subsidized housing. Disability Network staff worked with James’ new payee to get his first month’s rent and security deposit paid. This was James’ first apartment on his own so he needed to secure the household items he would need. Disability Network staff assisted him in finding dishes, a kitchen table and other basic items to get him started. 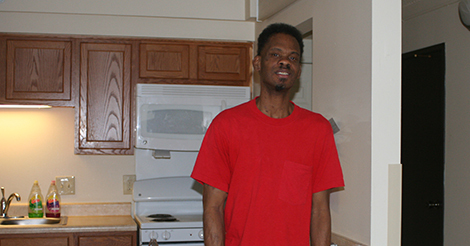 James is still living independently in his own home and no longer worries about not having a place to sleep.